UMX Ez-Adjustable Plain Color Cell Phone, Camera, MP3, Flashlight Wrist Straps. We keep in stock a large selection of plain color strap supplies for cell phone, camera, MP3 or flashlight wrist straps. The high quality, heavy duty and soft touch straps come with 14 colors available and come with custom Pantone PMS color option. The Ez-adjustable cell phone wrist straps are great for carrying your cellular phone, digital camera, MP3 or flashlight. Any custom length are welcome ! A variety of selection of deluxe cell phone wrist strap material, colors or imprinting are available with different style of metal or plastic hardware attachments. You can add-on variety of small items by using our cell phone universal strings. We keep large quantity of pre-printed cool theme cell phone straps in stock. 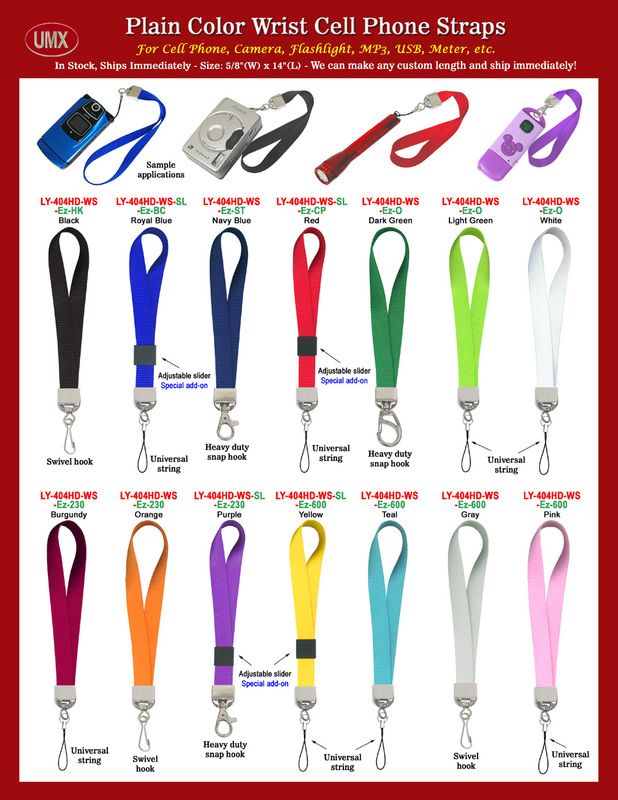 You are viewing Lanyards > Strap Supplies > Ez-Adjustable Plain Color Cellular Phone, Camera, MP3, Flashlight Wrist Straps.